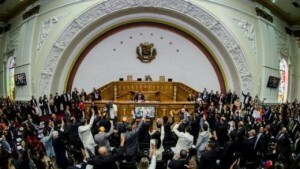 CARACAS - Venezuela’s opposition-controlled congress rejected the self-proclaimed lawmaking authority of a new legislative body elected last month at the behest of President Nicolas Maduro, widening the political divide in the crisis-hit country. Congress’s declaration of resistance on Saturday followed statements from a group of 12 regional nations plus the United States saying they would continue to regard congress – not the new constituent assembly – as the Venezuela’s only legitimate lawmaking body. “This is a congress in resistance of an armed military dictatorship that took over its authority and gained militarily what it could not gain at the ballot box,” congress Vice President Freddy Guevara said in a special session. The opposition won control of congress in 2015. But Maduro’s loyalist Supreme Court has tossed out every law it has passed as the oil-rich country slips deeper into a recession exacerbated by triple-digit inflation and acute shortages of food and medicines. The constituent assembly was elected in late July to re-write the constitution, which Maduro billed as the only solution to bring about peace after more than four months of deadly opposition protests. The opposition boycotted the election, calling it an affront to democracy. Maduro critics have called for an early presidential election, which they are sure he would lose as his popularity shrinks along with the economy. On Friday, the 545-member assembly granted itself authority to pass laws on its own. A bloc of countries calling itself the Lima Group, including Peru, Argentina, Brazil, Canada, Colombia and seven other nations in the hemisphere late on Friday joined the United States in criticising the assembly for “usurping” the powers of congress. Maduro’s government issued a statement rejecting Washington’s “meddling” in its affairs. Foreign Minister Jorge Arreaza told reporters he “regretted” that “some countries have expressed automatic solidarity” with congress rather than the assembly. Unrest has led to the deaths of more than 125 people since April as security forces met rock-throwing protesters with rubber bullets and water cannon. The United Nations said government troops used excessive force in many cases. The assembly’s new truth commission will investigate opposition candidates running in October gubernatorial elections, to see if they were involved in the deadly protests. Considering that many opposition figures supported the demonstrations, the commission could hobble their efforts at winning governorships in the upcoming vote.